﻿﻿﻿﻿﻿﻿ You know your gardening season is in full swing when you've gotten to the three Bs: birds, bees and blossom-end rot. We've reached the three Bs with a vengeance. Birds: A pair of mockingbirds are using our blueberry bushes as bird feeders, plucking juicy berries with impunity. Even garden netting can't keep them entirely at bay, though it does help. Worse than the berry pinching is their routine 6 a.m. wake up calls. Bees: The good news is that the bees are plentiful this year and happily pollinating our tomatoes, cucumbers, eggplants and peppers. New York City legalized bee keeping last year, which seems to be paying dividends in cucumbers, eggplants and tomatoes. Other bugs are not so pleasant. Our garden has been attacked by aphids all season, from the arugula to our rosebushes. To control the problem, we've been spraying our plants with soapy water to wash them off the plant (yes, just a few squirts of regular dish liquid and water will do.) We follow up by spraying Ortho organic insecticide on the leaves. We're also trying to reduce the ant population on our terrace. Ants, we've learned, cultivate aphids (they like a certain nectar the aphids secrete.) We're using Combat ant killer, squirting the gel on hard surfaces like the terrace tiles and the rims of pots. The combination of the two insecticides seems to be working well - though vigilence is a must. But the real bugaboo in our garden this past week? Tomato horn worms. Dozens of them. They're infesting our tomato plants and chewing the leaves off our pepper plants, causing us great consternation. We've declared all out war on the gross green ones, the offspring of the giant hawk moth. We've been out in the early morning and late evening (when they're most active) plucking the fat buggers off of leaves and stems. They're tough to find, so we look for tells: chewed leaves and black droppings. Once we've plucked all we can, we spray the leaves, especially the undersides where they hide, with Safer Caterpillar Killer, an organic insecticide. This is limiting the damage, thankfully. Last night we found several dead worms on our pavers. But we've never seen a worse infestation than we've had this year. Ugh! And last but not least, there's the dreaded blossom-end rot: Our earliest tomatoes have been affected by black leathery patches that form at the spot where the flower once grew. The only way to combat the rot is with fertilizer high in potassium and low in nitrogen. We were great fans of Hoffmans Tomato Food, but we can no longer find it in Manhattan. This week, we discovered Quick Solutions Garden Food, which has similar ratios of nutrients. Now, we need to have patience. The worst thing about blossom rot is snipping so many green tomatoes. We've been forced to pull at least 25 tomatoes off the vines so far. But there's no point in letting them grow, as the fruit will be half rotten from the disease. Each year we go through these traumas (or similar ones) and it really is quite frustrating. But I know the joys of gardening will come back when the tomatoes still on the vine ripen and I taste their juicy goodness! Mockingbirds in Manhattan and Who ate my blueberries? 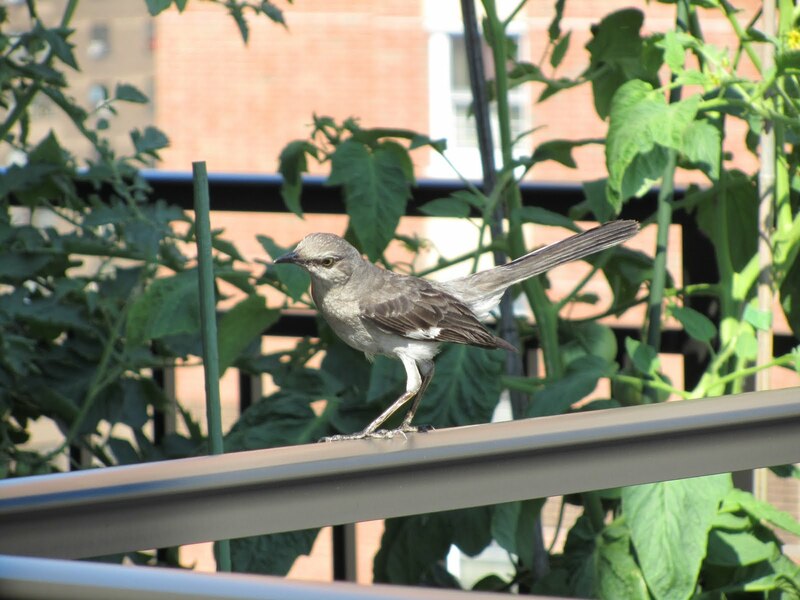 So, who knew mockingbirds live in Manhattan? In fact, a very resourceful little one has taken a shine to our blueberries. We planted two mature bushes this spring and the berries have been ripening at a rapid pace over the past two or three weeks. I didn't know, however, that they would attract the wily grey flier. I've seen him flitting about lately, not knowing what species he was or what he had his eyes on. Then this weekend, he landed right on our bush. As I jumped to the window, he hopped to our railing with a plump blueberry in his beak. He stared me down (as if mocking me!) and swallowed the big berry whole! Before I shooed him, I grabbed my camera and took this shot. That enabled me to identify him in my bird book. Since then he's dropped in several times a day, and we've rushed out to scare him off. Luckily he announces himself with his complex bird song, so we have advance warning. To thwart him, I'm trying to pick off all the ripe berries before he can grab them. Though when we're at work, he's going to have his fill. We might try to get a plastic owl to scare him off - but he seems too smart for that. I don't really mind sharing with the little critter, after all, he is a handsome fellow. I just hope he doesn't tell his friends!! And I hope he doesn't like tomatoes!